National tragedy of unidentifieds languishing in Medical Examiner/Coroners lockers. Dental information contained in this news release about Unknown human remains. The “Earthly Body” title seems interesting. Note that the burned body was buried and needed exhumation before this information was published. 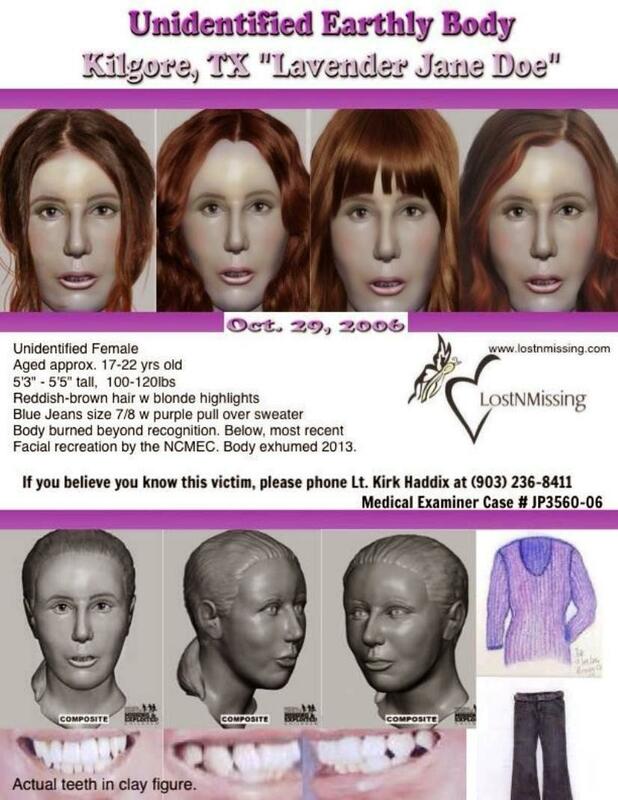 Apparently the remains were found in 2006. Another very cold unknown person case. These investigations rank just as high in priority as all the untested rapes kits in police closets and labs around the United States. The USDOJ needs to infuse $$ for the US ME/Coroner’s equally to what the crime lab systems are expending and their backlogs.In some jurisdictions the ME/Coroners are not directly associated with law enforcement funding at all. Compliance in reporting unknown human remains and reporting missing persons with DNA and dental records is a 3rd tier concern in too many US jurisdictions. Just ask the families of the missing. There are approximately 80,000 to 90,000 individuals reported missing to the National Crime Information Centeron any given day in the United States. And there are an estimated 40,000 sets of human remains that cannot be identified through conventional means held in the evidence rooms of medical examiners throughout the country. Joining us to discuss missing persons and how forensic scientists and researchers identify human remains to help bring closure to families and loved ones are Forensic Anthropologist and Professor of Biology at Mount St. Joseph University,Dr. Elizabeth Murray; and Communications and Management Director for theNational Missing and Unidentified Persons System (NamUs), Todd Matthews. Mount St. Joseph University is hosting the Tri-State Missing and Unidentified Persons Awareness Day on Saturday, October 15, from 10 a.m. to 3 p.m.
Dr. Elizabeth Murray‘s book, Death: Corpses, Cadavers, and other Grave Matters, explains what happens to the body after death and the role of the medical examiner. Related article: Ohio misses opportunity to find the missing and identify unknown human remains. This entry was posted in Uncategorized and tagged Forensic science, namus, unknown human remains. Bookmark the permalink.